i'm pretty sure you've seen how i store mine so i won't go into that, but so far i'm quite happy with it. i like that i can put everything in its place and it's out of the way. although i still wish my palettes could be somewhere closer to the rest of my makeup. Loving the basket looks gorgeous! That all looks so pretty packed away and I love your organization...well done! i find it really pretty, girly and cute ! Looks lovely - my favourite part is the rustic basket for your lipglosses - the fabric and the flower are very shabby chic. 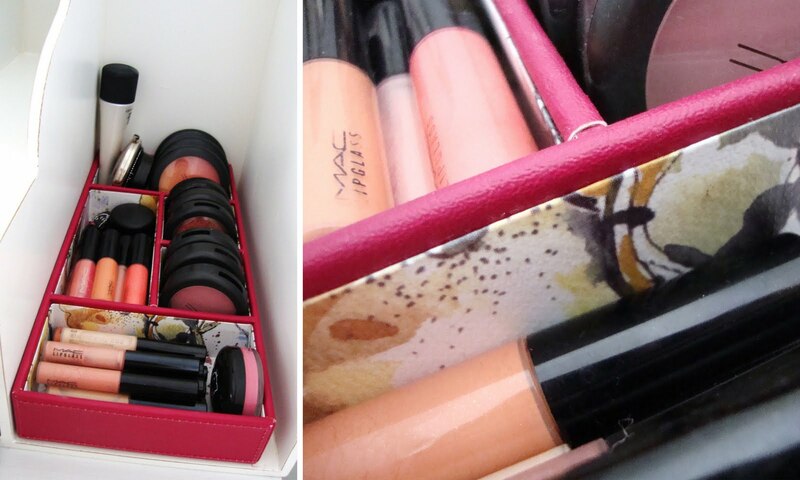 I store all my make-up in a caboodle - it's kitschy and reminds me of my college years. As for my extra make up - they are grouped in toiletry bags (one for face/cheeks, one for lips, etc) and stored in a cardboard floral box from ikea. I also like having things out of sight! I have a bit of everything and everything's from different materials. I envy how neat and organized your makeup is displayed! Absolutely cute and tidy! I love the storage system! I tend to organize mine in terms of brand and type of product: all the blushes by MAC, all the lipsticks from NYX, all the bronzers from "x" brand... etc. I love organising make up. I like the nice clean approach that you took with this! I wish I could do this but my room is bright coral soo....no can do. I love organizing and I love watching other people's storage systems! This is cute and tidy at the same thime! Love all your storage posts, love how this looks, I'm obsessed with organising everything! Mine is literally plastic drawers of the stuff. Every now nd then I tidy it but I do have a box for every day work products. im exactly the same as u! i totally get bored of my storage after a while and have to switch it up, plus when you get too much you just have to re-organise it! i can't STAND clutter and i am always organised with everything!!! I use acrylic storage boxes at the minute with one of those metal drawers ( a big one!) and then my palettes are stacked up side by side between the acrylic storage. i also saw those storage at tk maxx ITS SOOO GOOD very good prices too for some cute things! I never see anything as nice as what you get from butlers! Everytime i walk in there i ummm and ahh but thats about it! I love how you make the most of what you have! wow it's stored so nicely! so pretty!!! 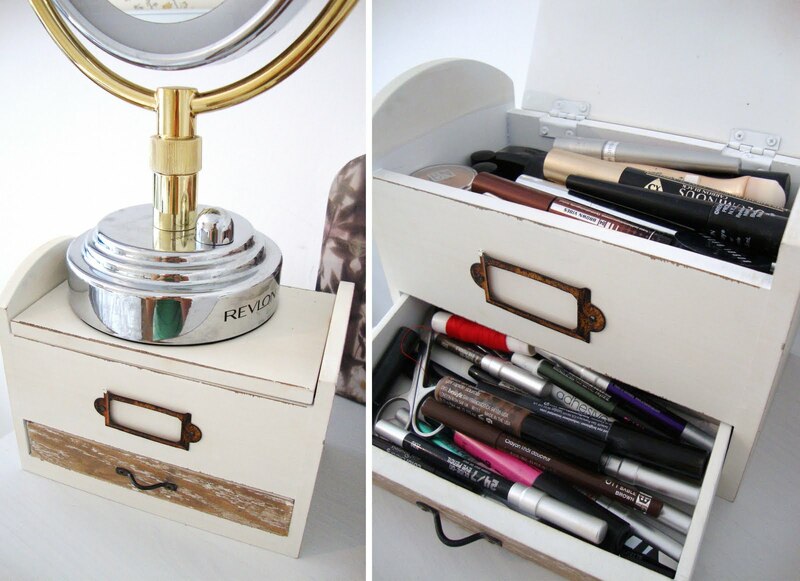 This is the most beautifully organized makeup storage I have ever seen! i LOVE seeing other people's makeup storage! Looks great! ps. ive tagged you. check it out. What've you done with all your nail varnishes? wow that looks so organized ! I love how simple, clean, and "white" everything is, it's very sophisticated. The basket is so cute! Oh, my!! I'm so jealous! Your storage is so neat and tidy and adorable!! Your makeup set-up is so pretty. I love seeing peoples organization ideas. Very pretty and feminine. such a cute storage *-*! love the organization, I'm trying to find a solution myself - I had just gotten everything organized and then well I moved in with the Mr. and am having to start all over again and with less space to boot! Hi again, sweetheart! Just read your comment: You are totally right, I should have add a winged-eye look to the Nars Alhambra eyeshadow... The truth is that I have to improve the eyeliner skills! Take care and say hi to lil Peanut!! P.S: Are you planning to attend the IMATS 2011? I love your storage set up, it's so pretty and tidy! i love your makeup storage. it's so clean and simple. You're storage basket was very inspiring. Actually all your posts are. Fingers crossed mine will look half as good as this! I once had a classmates, she has the habit to storage the make up, she always be willing to share with us. so miss the past days. Thanks for your blog, really lovely and i love it. Reading your blog, i miss one of my old friends, she likes storage makeup, and always shares with us. so miss the past days. your storage really very lovely.